Every half term we focus on a different Christian Value. Children are rewarded for showing these values in school, both in the class during lessons and outside when they are in the playground. In your classes, your teachers will be looking out to see who is showing the values. 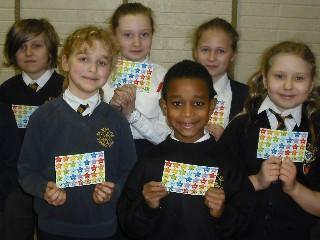 Each week, one child from each class will be chosen to receive a Good Values Award postcard. This will be sent home so your parents and families learn of your achievements. All children will also get to congratulate the children who receive the award in their weekly Wednesday Key Stage Acts of Collective Worship. Don't feel disappointed if you don't win the Good Values Award, though. Everyone can still work to earn rewards at lunchtimes. Our fantastic Meal Time Supervisors are looking to see which children are showing the values at lunchtimes. Exceptional children will be given a Good Values Raffle Ticket that gives you a chance of winning a fantastic prize during our Thursday morning Act of Collective Worship. It is great seeing everyone showing the values, but remember that you've got to be in it to win it - remember to put your raffle ticket in the correct box!